We first mentioned the WePad a few weeks ago and from what we saw, we were quite impressed at the alleged specifications. 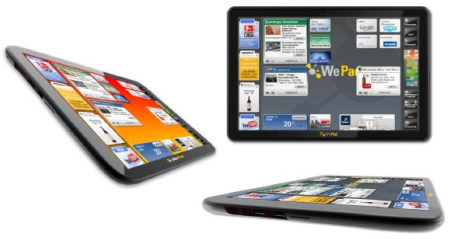 The whole WePad device seems to revolve around doing things that the iPad cannot do. Features such as a camera have been included allowing for video calls to be made. An SD card slot has been included along with USB and the ability to multitask. The WePad Tablet runs the Android operating system from Google [GOOG] and has access to the Android Marketplace to download applications. Overall it looks quite impressive and we hope that the CPU and graphics chip are up to scratch making it run smoothly. Update: It has an Intel Atom N450 CPU and no NVIDIA although it does support full HD, so perhaps another quicker than Intel chip. From what we hear there are a couple of versions with one being WiFi only costing ‚¬449. This will have 16GB of RAM. The other model will cost ‚¬569 and will have 3G support along with double the RAM (32GB) along with GPS being built in and a full HD display capable of 1080p. The WePad is expected to launch in July.